Castles, Kirks & Caves - Traditional Tunes for Cello. 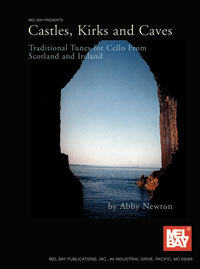 This is the second popular book of beautiful Celtic tunes compiled and arranged for the cello by Abby Newton. Most of the tunes in this collection are from her recent recordings, Castles Kirks and Caves and Ferintosh. The book is organized in three parts: Tunes, Sets, and Duos. The first part, Tunes, contains an assortment of twenty-eight tunes culled mostly from the well know Scottish and Irish traditional tune books including collections by Capt. Simon Fraser, Patrick McDonald, Niel Gow and James Oswald. The second part, Sets, consists of several tunes played in succession. Part three, Duos, includes two part scores (with treble and bass lines) that come mainly from James Oswald's Airs for the Seasons and Burke Thumoth's Collection of Scots and Irish Tunes 1745.